A working wheel on your wheelbarrow makes a difference. Three loads I had brought with the flat tyre, and satisfaction had balanced difficulty. But with a pumped new tyre, nine loads flew up from the horse field today. The newest raised bed is nearly filled, is covered with pots where we decide what will take root where. A working wheel is better, though the lack of it enhanced the joy of having. I am learning to love ease. To sit back after the work and admire. 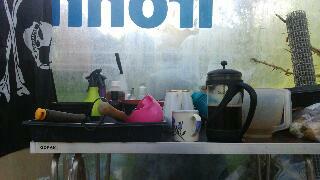 In the polytunnel the squashes and the melons have their handmade frames, and I have a mug of coffee. There is a quiet happiness composed in your description, and in the collection of objects on the table. Rewarding and refreshing. Wrote this in situ on my phone- could barely move my arms from the day's exertions but (as you will know) a good days' work is a source of reward and refreshment. And the polytunnel is one of those places where everything looks happy. 'Learning to love ease.' What is that? I wish my tyre on my wheel barrow worked - I miss it.